After getting the CycleOps Hammer smart trainer I’ve been experimenting with how it, my Stages power meter on the Salsa Vaya, and the TrainerRoad PowerMatch function work together. In short, PowerMatch is designed for those who have a power meter on their bike and want to ensure that the resistance and workouts are consistent indoors (with the smart trainer) and out (with just the power meter). While I only use power data for training indoors during the winter (never for outdoor training), I do like to look it over after outdoors rides and thus want to be sure the two are as in line as possible. To automatically handle differences in power meters, TrainerRoad’s PowerMatch calculates the offset between the power meter and smart trainer, then adjusts the resistance every 10 seconds to accommodate the difference. On its face this makes sense to me, but whenever I’d enable it the resistance would get bit surge-y feeling during harder efforts leading me to think something wasn’t quite right. I suspect this is because of the Stages being single-leg, I likely have a bit of an imbalance between legs, and my recent rides in TrainerRoad have shorter efforts than the sustained stuff that single-leg meters are best at. So, I started to think about if something else was right for me. Power Meter Normal, PowerMatch Auto: Displayed power is from meter, with this data used by PowerMatch to determine resistance. Occasional surging feeling, but overall good. While riding it appeared that power data jumped around. Power Meter Normal, PowerMatch Disabled: Displayed power is from meter, resistance set by trainer’s internal meter. Displayed power data appeared low (5-10W) when holding an interval steady. Power Meter Cadence Only, Power Match Disabled: Displayed power is from trainer, resistance set by trainer’s internal meter. Feels smooth (no surging) but seemed marginally easier than with PowerMatch. Power Meter Normal, Power Match Manual: Displayed power is from meter, resistance set by trainer offset adding/subtracting manual value; no automatic adjustment of offset done. With Power Meter Normal, Power Match Manual looking most like what I wanted, I set out to determine the offset between my Stages meter and the CycleOps Hammer. To do this I first ensured the Stages and Hammer were calibrated. TrainerRoad was set to have PowerMatch disabled and the Stages meter to Use Cadence Only. My Garmin Edge 520 recorded power from the Stages meter and TrainerRoad recorded the Hammer’s data. I then rode a custom TrainerRoad workout that has a warmup, then a series of 1 minute intervals at 60%, 70%, 80%, 90%, 100%, and 110% of FTP with 30 second 50% rests between in Erg mode so trainer resistance adjusted automatically. After this I did a 30 minute Free Ride where I shifted to adjust speed (and thus power), trying to get a good mix of steady state and short/hard intervals, under different situations, to get sane date to compare. To cut down on data misalignment both of these rides were non-stop spins without pausing, doing my best to start and stop the Garmin along with the TrainerRoad workout. Sudden transitions decreasing power show 0 values when measured by the Hammer, but still some power with the Stages. Hammer seemed to measure higher, with the variance becoming greater as power output became higher. I don’t believe the sudden transitions are a concern nor really something that can be accommodated for, and I don’t think they’ll be a problem for the normal Erg mode workouts where the main desire is to have the trainer providing resistance. This is likely a simple side effect of the large flywheel in the trainer taking a while to slow. Across these two rides the two meters are within ~1 W of each other. While I originally went into this investigation looking to see how much of an offset I’d have to set up in Power Match Manual, I’m now thinking that the Hammer is close enough to the Stages to simply use Power Meter Cadence Only, PowerMatch Disabled. It’s possible this could skew a bit more as I do higher power efforts, but I think this will probably still be within sane ranges. It’s rare that I’ll see the 100W difference like in the high power effort of the Free Ride 30 test (700-800 W range), most things will be in the 200W-300W steady state range where alignment seems sane. This will cut down on the surging that seems to be coming from the single-leg power meter, still provide sufficient correlation between indoor and outdoor efforts, all while having the benefits of an Erg mode smart trainer. It’d be nice if TrainerRoad offered some sort of percentage correction, but perhaps this is why PowerMatch instead does a frequent reassessment and is turned on my default; better to check the offset and correct vs. attempting to figure out a scale. Being able to see how PowerMatch is working internally would be nice, but I’m not sure this would add any real value to the product. 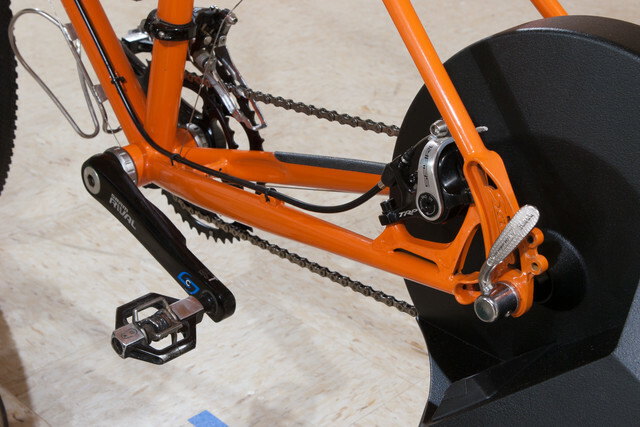 The “percentage offset” you describe is likely due to differences in the deveces and less your pedaling style or the single-sided power meter. It sounds like a classic scale/offset discrepancy between the devices. The strain gauge is a linearly device that has an offset and slope. The manual offset can compensate for offset but not the difference in the slope. As the power numbers get larger, so does the difference. Adding the ability to specify the “truth” power source and scale/offset of the other would be the optimal solution. This would also solve the problem if a pedaling imbalance did skew the single-sided power meter under high output conditions.